There’s less competition for success right now. That means there are more open doors. Go for it! And while you’re going for it, do not apologize for it. In fact, be just the opposite. 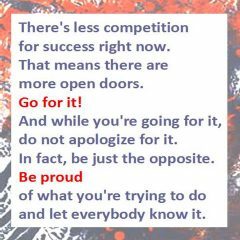 Be proud of what you’re trying to do and let everybody know it.